So yesterday was Mother’s Day. It was my first as the mom of two boys and my only request was to sleep in as long as possible before it was time to get ready for church. Mainly, I just didn’t feel like “doing breakfast” and navigating the newest rendition of 40 thousand questions before coffee. Thankfully, I have a killer husband and he gave me my heart’s desire. He even locked the bedroom door to foil Oscar’s secret plan to come and jump on me in my sleep. Score! It really was the best Mother’s Day I have ever had. Earlier in the weekend I decided that I might like a new dress for the occasion so I set out to see what I could uncover at Marshalls. I didn’t know exactly what I was looking for. I just knew that I wanted to feel special. I had initially planned to get a long dress because while I am losing some of that baby weight, I still feel like I need to cover up. And while I am being all up-front and whatnot, I’ll admit that I am unsure of myself and still a bit ashamed of my “Mom” physique. Of course these are personal issues that I am overcoming as time goes on, but you know. Baby steps. I found a dress that looked just plain ridiculous on the hanger. It was floppy and odd with pleats and pulls in the weirdest places, yet I was drawn to it. It was shorter than any dress I own, but I loved the weight and feel of the fabric and I just couldn’t put it down. I thought, why not try it on? You never know. In the fitting room I went through over 10 dresses. Some cute, but nothing was working. They were safe. They were OK, but not special. And then I turned to the strange dress. I slipped it on over my head and the transformation was instantaneous. All of my insecurities about this imperfect mom body just melted into the beauty and comfort of the dress. It was like a second skin. And it fit perfectly. I knew I had found my dress. 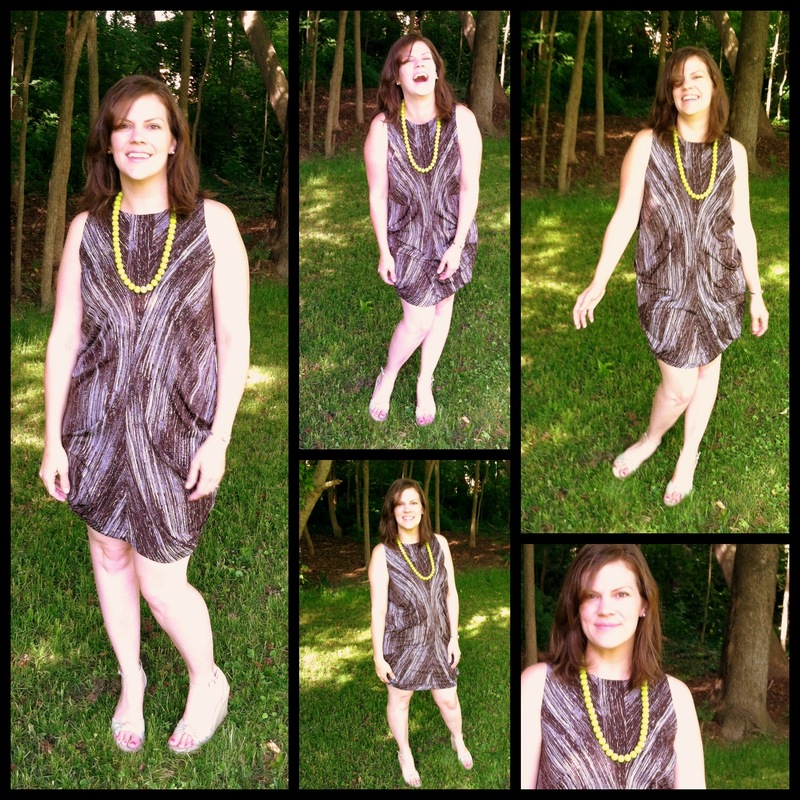 What does a dress have to do with Peter Shankman? Nothing exciting happens inside your comfort zone. Among many other nuggets of wisdom from the conference, this one stuck with me. As I was standing barefoot in the Marshall’s dressing room, I found myself repeating it over and over in my head. When I got dressed on Sunday, I realized that I was standing taller, smiling bigger and just generally feeling more like myself in this dress. I took a chance on something that didn’t seem like “me” at the time and it ended up being a better fit than any of the typical, safe options. Interesting. And as I am prone to dwell on things, I realized that is exactly what we do as writers. As bloggers who live our lives out loud and online, we can so often fall into the rut of safety and comfort. So often I see women writing about how they just feel stuck or like their content is stale. I have been there. And while I don’t think you need to jump out of a plane (unless that is your thing), it might just be time to take a step outside of the box and see how you feel. How long has it been since you took a risk as a blogger? As a writer? Wearing this dress was like a breath of fresh air for me. It woke me up in ways that I had no idea a dress could. And I think we all know it wasn’t really the dress, but the way it made me feel – like I am finally starting to be myself again. I am not my old self, but the newest version of Andrea Updyke. Wife. Mom of two. Writer. And comfortable in my own skin. What risks should you be taking? What’s stopping you? Ha! Now that’s how to start a Monday. Thanks so much for reading! i like that a lot. and seriously, you look hot. 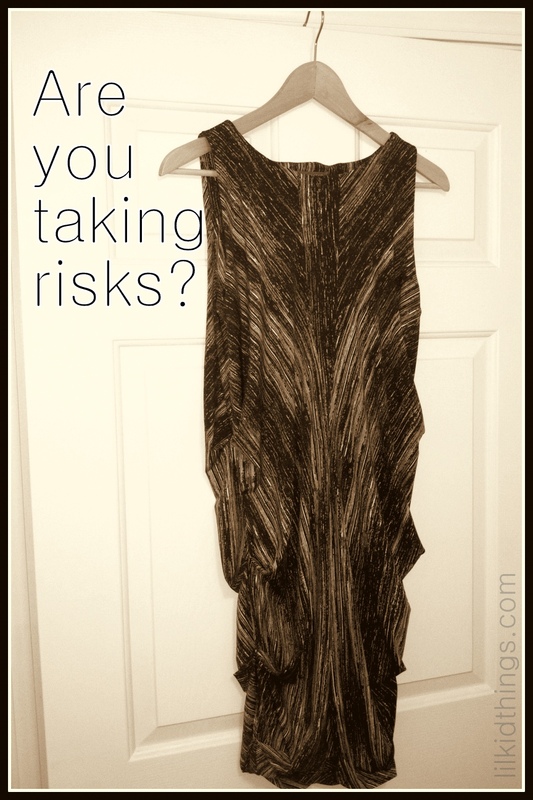 I agree with Peter, you look AWESOME in that dress, and yes there’s nothing like taking a risk. My parents always taught me to “dare to be different” and it’s what drives me. It looks like you’re driven to take those risks as well. Congratulations on more than just the dress. Oh Andrea! What a FANTASTIC post. And you rock that dress. I love it!! You look great, and the fact that you feel great shows. I’m going through the same… mom to two boys, trying to find ‘my style’ since everything has changed. I’ve always been a conservative dresser. I like solids, earth tons, and simple lines. I am definitely learning to leave my comfort zone and have fun. My favorite item right now is a BRIGHT and very SHINY pair or red wedge peep-toe pumps. A few years ago I never would have picked red. Great post, Andrea!! I think I need to write “nothing exciting happens in your comfort zone” in big letters on the wall of my office. I need that reminder. And yes, you look FABULOUS in that dress! You look amazing! I loved what Peter had to say too! It’s so true that nothing ever happens inside your comfort zone. I love that you’re applying that throughout your life, and not just in business. 😉 You rocked the dress, btw. You look fantastic in that dress, Andrea. Great post. BRILLIANT post, girl! I’ve been doing this myself lately with my clothes– wearing things I was normally too lazy or slouchy to wear. And Peter’s quote is perfection. I’ve found that it’s so true– I’ve stepped out of my comfort zone more in the past year than ever before and it’s been working (so far at least)! You look great in the dress! That risk paid off :-). I’m trying to do the same in a few areas of my life. It’s scary but rewarding. Good for you! this was an amazing post!! Oh it made me smile Andrea! Your outlook is dead on. And you really do look smoking HOT! I love that you took away that thought from what Peter said. It’s been playing in my head too! Love it. And I love that dress on you, too! Gorgeous, inside and out. You look gorgeous! I love this post. I must say, you snagged me with your headline. Smart writer. Hot writer. Smart, hot friend. That last part is my favorite. BTW, it is not the dress, it is the attitude you exude while in that dress. Great post! @petershankman inspires me, too! I love how you took a part of Peter Shankman’s talk and put it into action in your own life. And you look gorgeous!